How will my friendship be affected if I hire a lawyer to negotiate a settlement after my friend’s dog causes a Missouri dog bite? While some friends may take it personally that you would choose to consult with an attorney following a St. Louis dog attack, the truth is that enlisting the aid of a professional may in fact help save your friendship. If your friend is really a good one, then he or she should be concerned that you do get the compensation you need to pay for any necessary medical treatment. Sometimes, bringing in a third party may help you maintain your relationship while allowing the professionals to handle such nitty-gritty details as money. An experienced attorney can help you get the damages you need and get you a fair settlement to help pay your medical bills, delicately handling the negotiations without alienating your friend, neighbor, or family member who owns the dog. 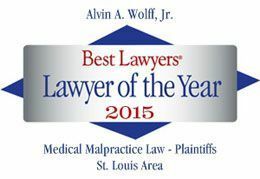 For more information or to set up your free consultation today, call Alvin Wolff at 877-241-1020. We will also present you with a complimentary copy of our book, The Guide on How to Pick a Lawyer.